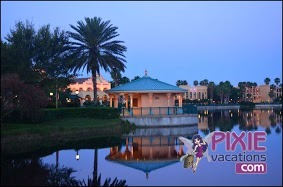 I am a travel agent for Pixie Vacations, an authorized Disney vacation planner. Currently Pixie Vacations is running several exclusive offers that include discounted rooms and tickets. In addition to theses savings, when you book a package including park tickets through these offers you will receive a free water park or Disney Quest ticket for each member of your party! Here are the dates and resorts available. Pop Century, Art of Animation (Cars and Little Mermaid), Port Orleans Riverside, Contemporary, Polynesian, Boardwalk Inn, and Beach Club. This entry was posted in Deals and Discounts, Uncategorized and tagged discounts, Resorts, saving money. Bookmark the permalink. I will be in Disney World from June 3-10 2013. What is the discount offerings for the Beach Club from June 7-9? We have a vacation booked at Disney World for June 10 through June 20, 2013. We’re staying at Pop Century and have purchased the dining plan, plus 10 day Park Hopper Tickets. I called Disney to have the special offer applied, but was told since the travel dates ended on the 14th, we would not be given the discount. Do you have other discounts available to us? Thanks for reading! I sent you an email with some info. Thanks for reading! I am happy to help if I can!